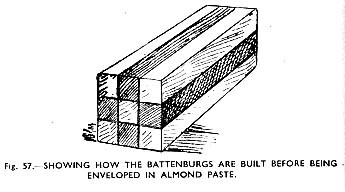 Food History Jottings: Battenburg Cake History Again! This all sounds plausible, but Brown does not inform us of her sources. I would love to know who it was who decided that a celebration cake was required. Until Catherine Brown can point out the primary sources for these statements, I am inclined to believe that she is simply repeating a popular anecdote which appears to have surfaced fairly recently and has no basis in fact. In a recent Great British Bake Off programme, the television historian Kate Williams repeated the same myth. My good friend Robin Weir, knowing my interest in the Battenburg, was amazed to recently come across an illustrated recipe for an identical cake called Gateau à la Domino in a July 1898 edition of the Victorian food and housekeeping magazine The Table, published and edited by the remarkable Mrs Agnes Berthe Marshall. 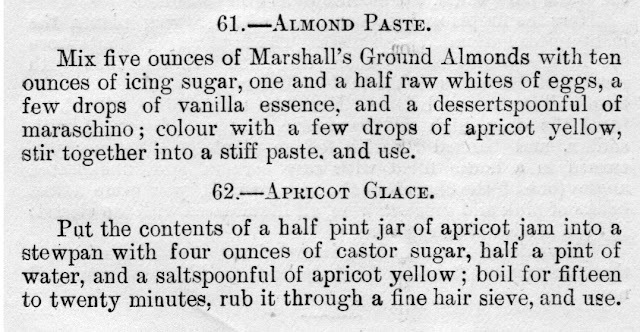 Although Mrs Marshall's four books on cookery and ice cream are now fairly well known, The Table is rarely cited, though it is one of the most extensive and richest sources on the domestic life and food of the late nineteenth and early twentieth centuries. She launched it on 12th June 1886. There were 1690 weekly issues until June 1918. It was then renamed The Table and Housekeeper's Journal and was published fortnightly with 547 issues until its demise in September 1939. In its day The Table was the most important food magazine published in Britain. Mrs Marshall died in 1905, but The Table went on and on. 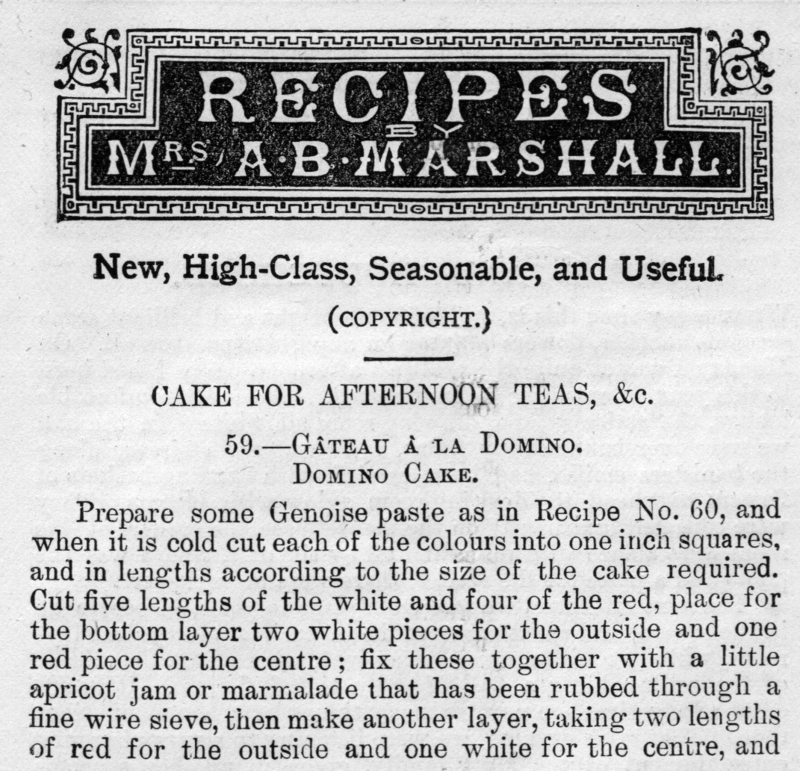 Mrs Marshall's recipe for Domino Cake appeared in 1898, the same year in which recipes for two almost identical cakes - Frederick Vine's Battenburg Cake and Robert Well's Neapolitan Roll were published. 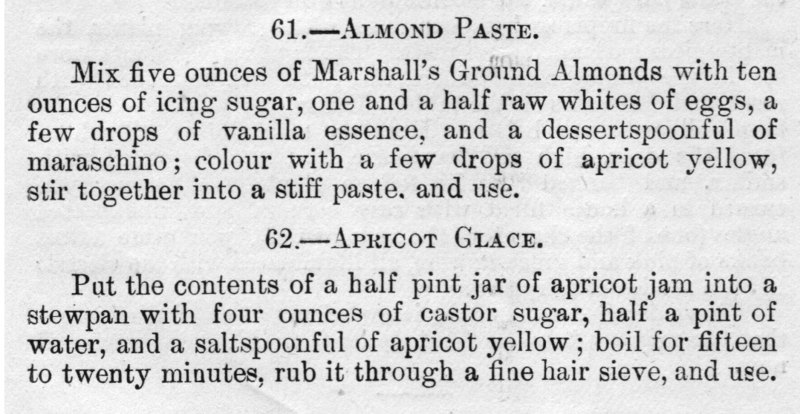 In appearance, Vine's cake is identical to Marshall's with nine panes of alternate pink and white genoese enclosed in an overcoat of almond paste. 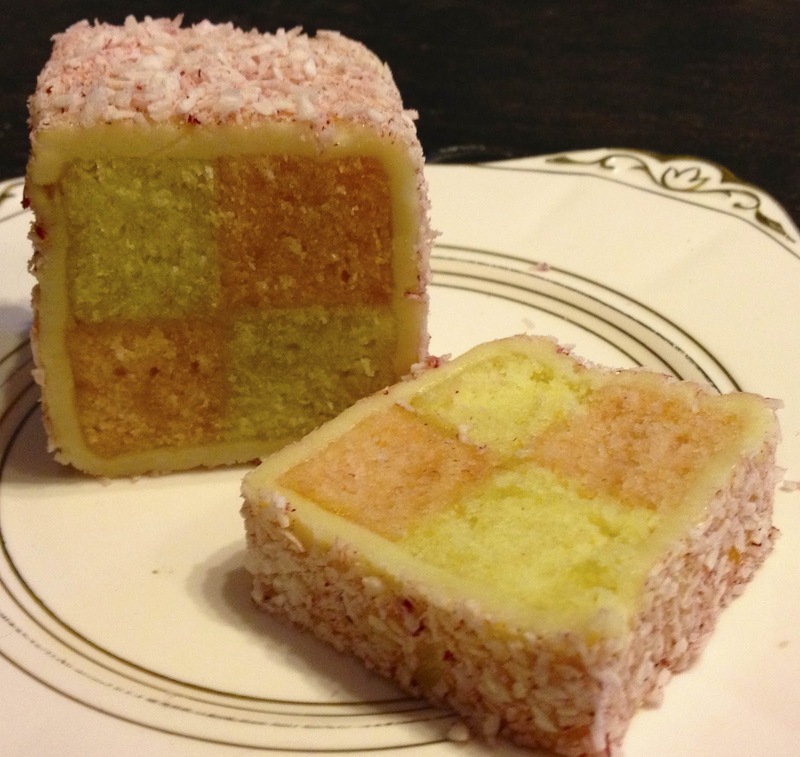 Well's cake on the other hand, with its four panes is closer to the modern version that we call Battenburg Cake today. If you have not read my earlier posts on this subject, here are some images to show you what these three cakes looked like. Wells does not illustrate his cake. 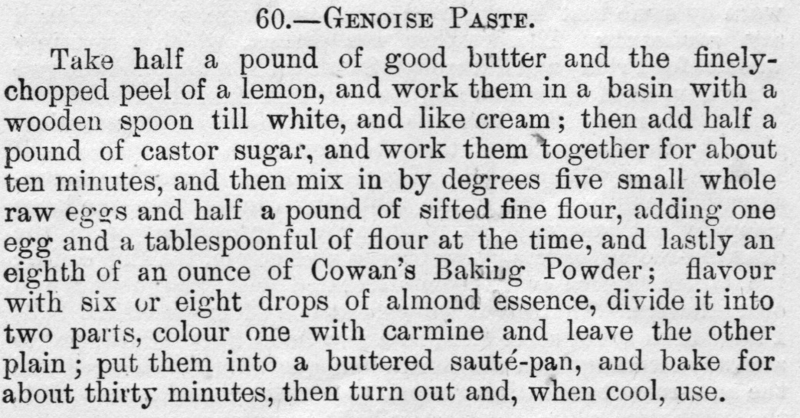 so I made his Neapolitan Roll from the recipe he published in Cakes and Buns (1898). Unlike Marshall's and Vine's versions, Well's cake was dusted with pink desiccated coconut and has only four panes. Domino Cakes were normally small rectangles of genoese decorated with icing in the form of dominoes, as No. 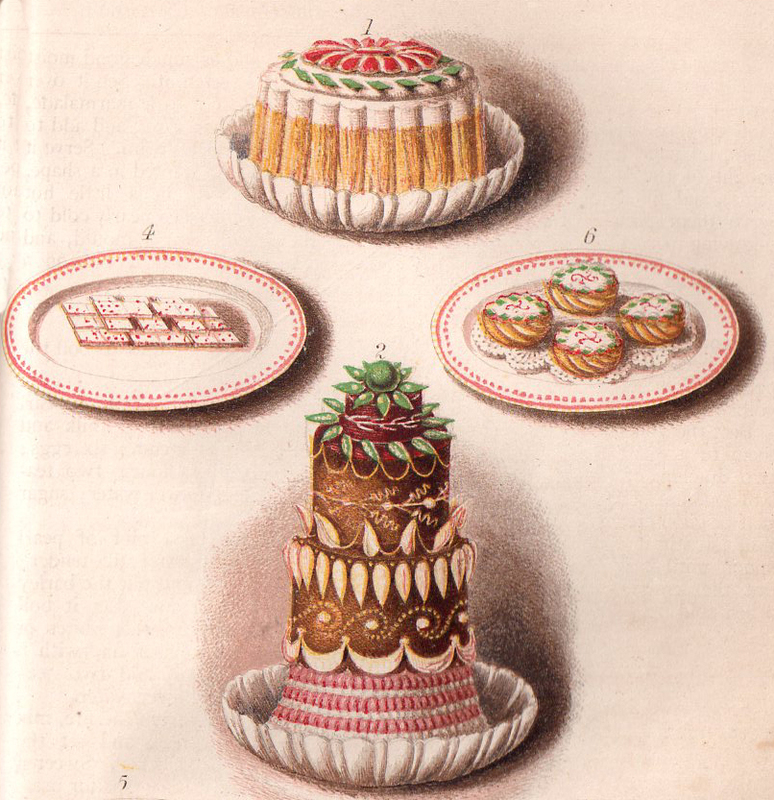 4 in this fine chromolithograph by Kronheim from Mary Jewry, Warne's Model Cookery and Housekeeping Book (London: 1868). What is overlooked in all the Battenburg Cake myths is that there were actually two weddings between English princesses and Battenburg princes. 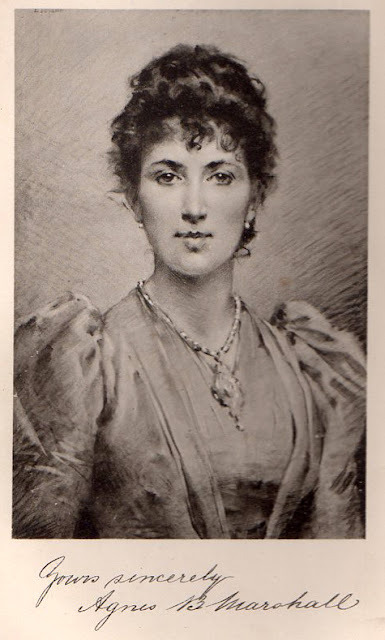 The first was that of Princess Victoria, Queen Victoria's grandaughter, to Louis of Battenburg in 1884. The second took place the following year, when Louis's brother Henry married Queen Victoria's youngest child Beatrice. 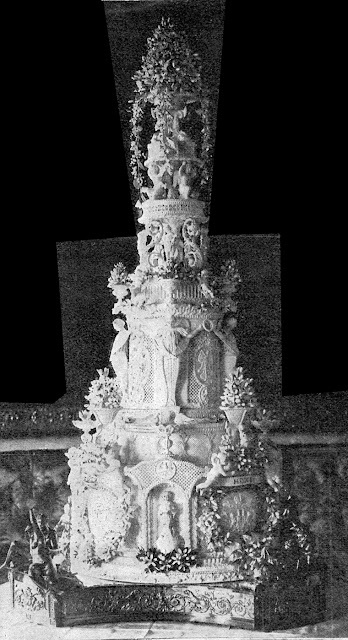 The bride cake illustrated above is that presented to Henry and Beatrice at their wedding in 1885. When they cut this remarkable cake, I wonder if there was a pattern of red-white-red-white running all the way through it. *Catherine Brown, Battenberg Cake; A celebration confection fit to grace a royal wedding. The Herald, March 29th 2003. Ivan, what a nugget your blog is! Absolutely fantastic to read, pure pleasure. I am not a baker, but I love baking and am very interested in history behind every famous European cake. Thanks a million and more for your great job done on research and more thanks for sharing with us those fabulous recipes. I was delighted to discover while reading your previous article on Buttenburg Cake history that my instincts about coloring the red sponge were not very wrong: I used raspberries rather than red food color. Wishing you very best, your new fan, Natalia. After reading your posts, I am convinced that Battenburg cake was a variation on a common theme. But why did the English name it after the German family if its creation didn't have anything to do with the prince? I am no food historian myself but I specialize in history with a particular interest in that branch of historical research which examines how and why myths are created. Perhaps there is evidence that supports the making of the 'wedding cake' theory or even the four princes 'myth', which has not yet been discovered. I hope you will keep your readers up to date if and when this happens. Its kind of weird but has lots of information. Are you sure that its all true? 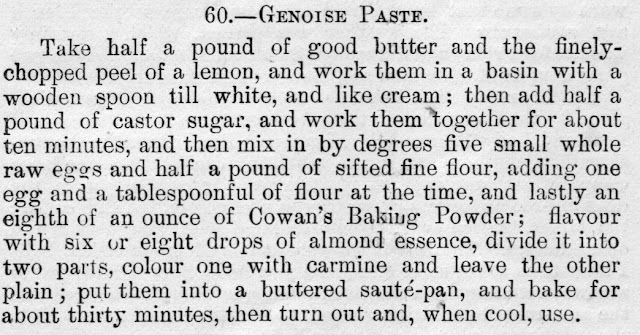 Interestingly I am researching a friend's family tree and her family have always belived that a Master baker called Giessler invented the battenburg (and the Angel) cake. He arrived from Hessen in about 1881 and most of his children followed on the profession.